Specs taken from the datasheet. Click the "Expand" button on the right to view. Repetition rate, multiplexed: master clock must follow slave clock by at least 10 ns and precede next slave clock by at least 50 ns. 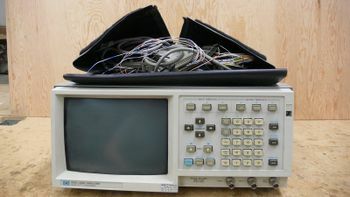 Acquisition memory: 1024 samples, 6 bits/channel, 2 channels; up to 1000 samples are used for display; magnifier allows full-screen display from 1000 samples to 25 samples; the entire 1024-sample record can be accessed via HP-IB (GPIB) and HP-IL. Cursors: two cursors (X and O) are provided for making voltage and time measurements on displayed waveforms. Both absolute and differential values are provided for voltage measurements. Dual cursor time measurements can be made between two points on the same waveform or between two points on different waveforms. Cursor statistics: X to O cursor statistics are provided for continuous voltage and time measurements: max, min, mean, and standard deviation. Single cursor voltage statistics can be obtained between two points on the same waveform or between two points on different waveforms (time only). Cursor placement: both X and O cursors can be uniquely specified with respect to the tracepoint or acquisition start, by selection of channel 1 or 2, rising or falling edge, voltage level, hold or delay time. Input channel labels: Up to eight state, up to 16 timing, user-defined, five-character labels may be assigned bit patterns in any configuration up to 16 (HP 1630G) bits/label. Bits may be used in more than one label and need not be contiguous. User field: All labels with four bits or less allow mnemonics to be assigned to specific patterns. Primary use is to identify such functions as read, write, opcode, etc. Relocatable field: Up to sixteen module starting locations may be specified, allowing trigger parameters to be based on module names, plus an offset value. Time-of-day clock: A 24-hour clock prints out the time of data collection on all stored records. This page was last modified on 18 December 2016, at 16:31.